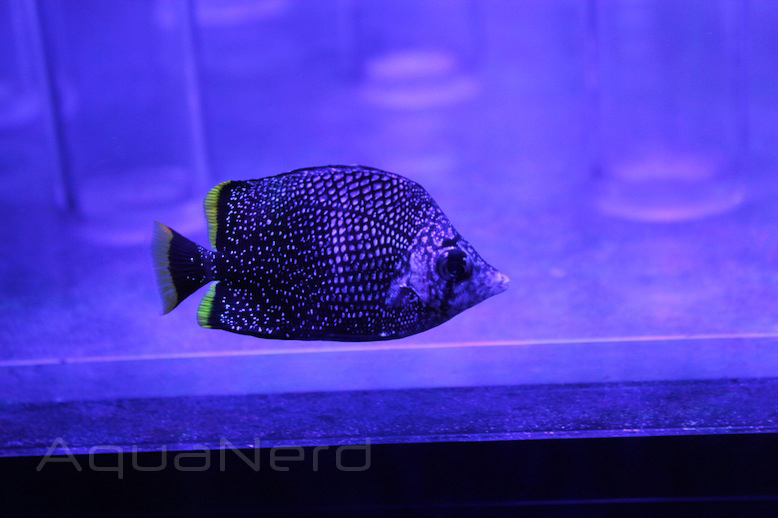 What most MACNA goers probably overlooked in all of the hustle and bustle of the very packed show was one special little fish tucked away amongst the large and beautiful coral colonies at the Global Oceanic Life booth. That fish just so happened to be a wrought iron butterflyfish (Chaetodon daedalma), which is quite a rare find in the marine aquarium trade. This Japanese endemic is a highly coveted fish to say the least, often fetching thousands of dollars per individual and rarely lasting long when available. Most individuals go to the tanks of aquarium keepers in Asia, with just a handful ever making it to the states, especially in as good condition as this one was. The fish was quite timid at first, and understandably so with the thousands of aquarium nerds filling the show floor. Fortunately, this rare gem eventually got used to our presence when virtually nobody else was around, and it came right up to the front of the tank for our little one on one photo session. Rumor has it that the fish sold for approximately $3000, which if true, is actually under the usual market value.